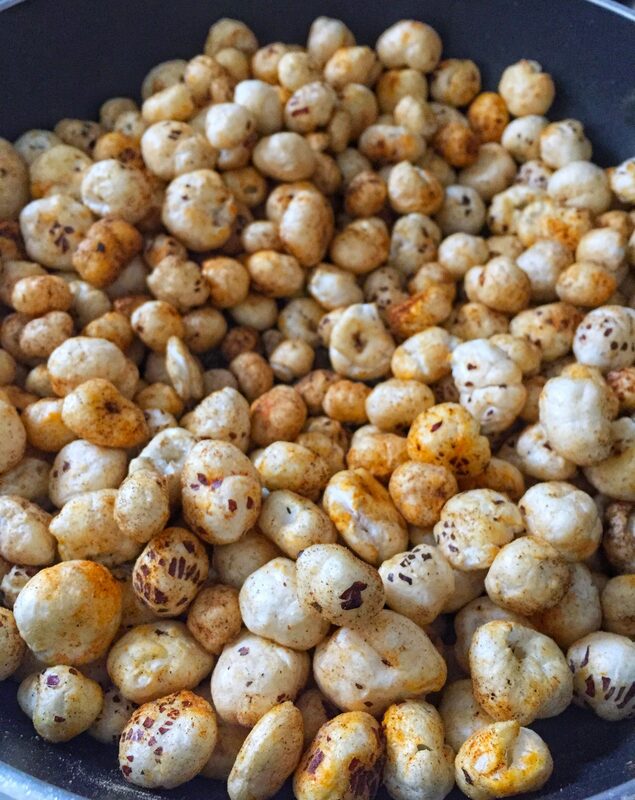 Foxnuts or Phoolmakhaana (thats what these are called in India) are a very popular fasting food, because these are not considered a grain, but a seed.It is highly highly nutritious. Its health benefits are superior to those of dry fruits such as almonds, walnuts ,coconut and cashewnut in term of sugar, protein, ascorbic acid and phenol content. It is also a good source of protein, carbohydrates, fibre, magnesium, potassium, phosphorus, ironand zinc. It is very high in fiber and low in calories.It is a great addition to regular diet, and also an inevitable option if you are on a low cal , sugar free , vegan diet. Also known as lotus seeds, Gorgon nut, Euryale Ferox, this is a non-cereal nut, grown in the stagnant water of wetlands, tanks, ponds lakes and ditches.It is mainly grown in India, Korea, China, Japan and Russia.This is a native Asian lotus flower water plant and is mainly cultivated for its edible seeds. Fox nuts are used in many dishes in India. They are also considered as very pious food and used during many holy rituals. It contains anti-aging enzymes, which are said to help repair damaged proteins. They also helps to lower the blood sugar levels, so a healthy snack for diabetics. Makhana seeds can be eaten raw, roasted, fried or ground. You can roast them using any of the methods described below, and store them to be used in your dishes. It can be added to soups, salads , curries rice or other dishes. These are also used in kheer, sweet dishes and puddings. Also if ground it can be added with other gluten free flours to enhance its benefits. 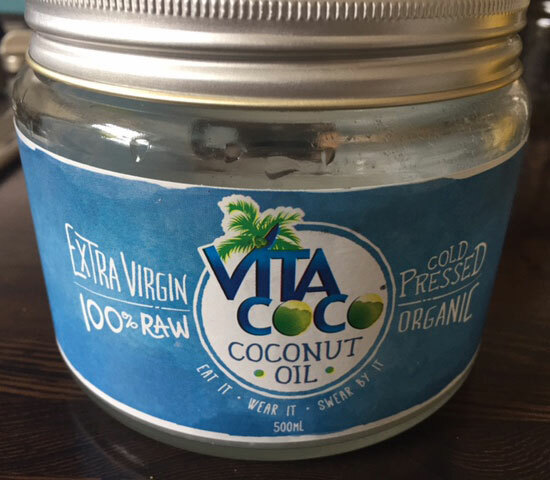 The benefits of this little puffed nut are innumerable, and this should be added in our routine diet, to make sure our body gets all the nutrients from this . Oven method– Preheat oven @180C. Layer the founts in a single layer and put in the oven for about 8-10 minutes. Check after 5 minutes, shuffle them and keep in the oven again for another3-5 minutes. When done these will be slightly golden and crispy. 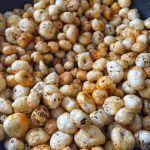 Microwave method– In a microwave safe bowl, heat the fox nuts for about 30 seconds, take these out, mix and heat again for another 30-40 seconds. 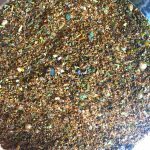 Pan method– You can dry roast in a non stick pan for about 8-10 minutes. Keep stirring in between so that the fox nuts do not burn. Adding ghee/ coconut oil enhances the taste of the fox nuts, and its seasoning, so in my recipe I have roasted these in a pan with some ghee. 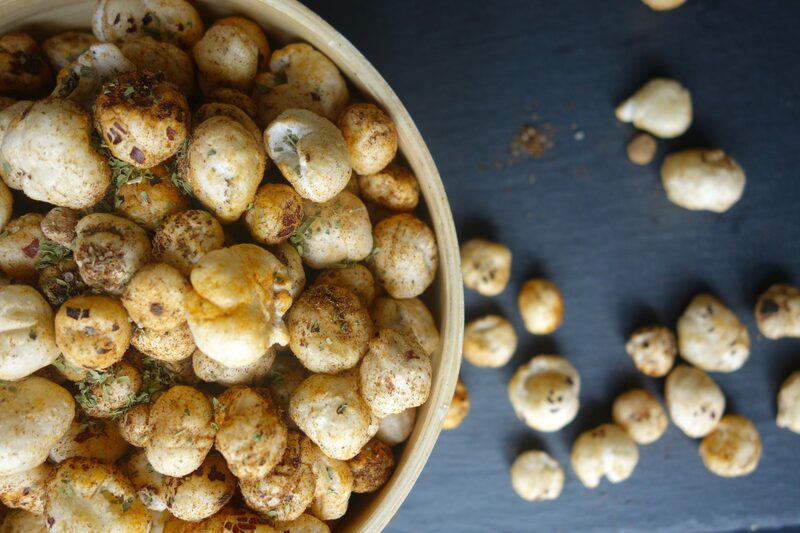 The below snack recipe is really simple, and all you need to do is roast the foxnuts using any of the above methods and add the seasoning/ condiments. 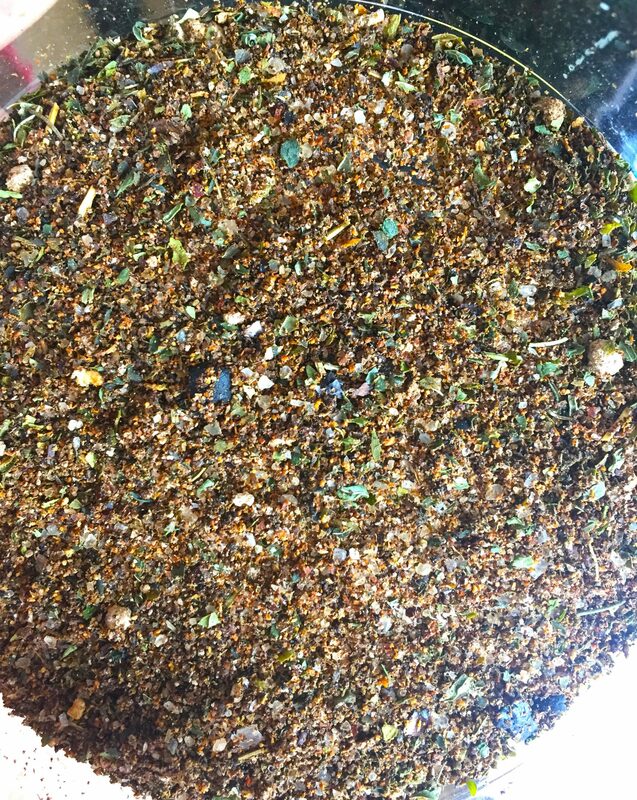 The seasoning that I’ve prepared is a bit tangy and spicy, but you can make a number of seasonings as per your taste. 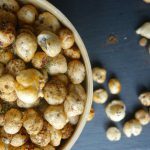 The simplest would be to roast foxnuts with a little turmeric in a little ghee or coconut oil as per the below method in the recipe section, and add salt and pepper as per your taste. You can even add chilli flakes, or chilli powder to make this spicy. 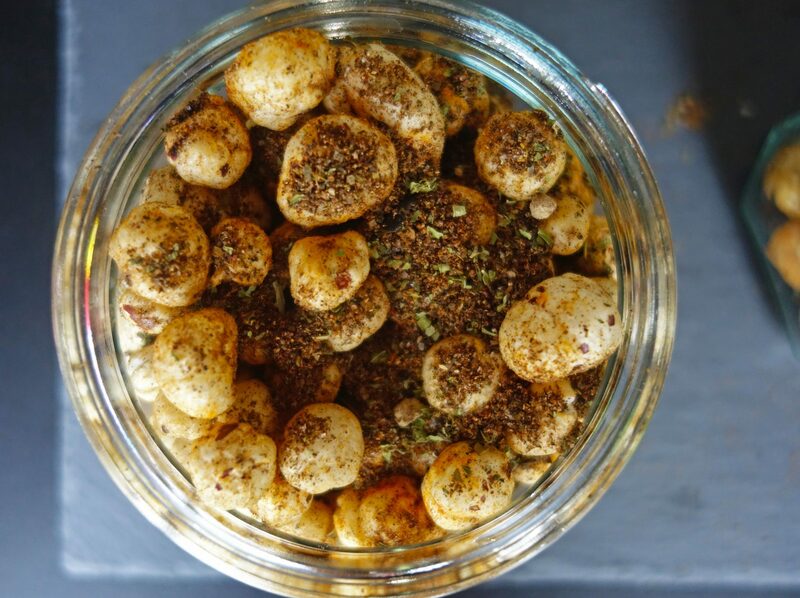 The detailed recipe of tangy roasted fox nuts, that I usually make is below.Enjoy the recipe, and do let me know in the comments section how it turns out.Also try different seasonings to make a variety of snacks!!! Heat ghee / coconut oil in a pan. Add foxnuts/makhanas, add turmeric powder and roast for 10-12 minutes,till these start getting a little golden and crispy. Make the seasoning- Mix all the dry ingredients together- salt/ pepper/chilli powder/ black salt powder/amchoor powder/roasted cumin powder and dried crushed mint leaves. Add the seasoning to the foxnuts and mix /shake well. 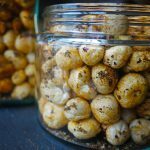 Keep it in an airtight container, and it will be good to munch in for months.